A dramatic arrangement of deep red, purple and magenta hues, it's the perfect choice for a date night out, to say I'm sorry, or just because. 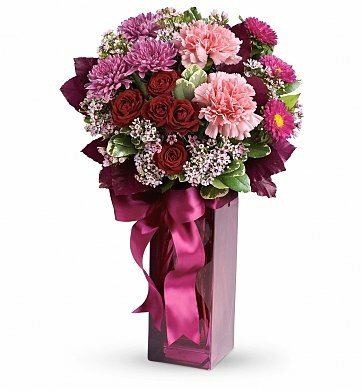 Its tall plum-colored keepsake vase arrives filled with water, and flowers are ready to be immediately enjoyed upon delivery. L'amour! Dark Red Roses (40 cm). Lavender Waxflower, Satin Ribbon, and more. Standard Arrangement Measures 13" x 18". True Love's Wish Bouquet is a hand delivered gift. These gifts are delivered by one of our local design centers located throughout the United States and Canada. Same day delivery is available for most gifts when ordered before the cutoff time. The cutoff time for True Love's Wish Bouquet is 2 PM in the recipient's time zone. My sister, the recipient said the flowers were so fresh and so beautiful and they continue to look good. She received them on March 5th and says they are still beautiful. I am so very pleased with the flowers, the delivery and the customer service. The bouquet absolutely exceeded my expectations. Delivery was completed in less than 24 hours along with a very minor complication--they could not find the exact vase as displayed. However, the vase that was sent was still absolutely beautiful. My favorite part of the bouquet was how the lilies when from buds to fully bloomed after a few days of arrival. It was more of an evolving gift than just boring standstill flowers. A nice gift for a beautiful lady. This was my first experience. I ordered flowers and chocolate for my husband at work. I liked the choices available online to put together your own unique gift. I made a same-day order and it was delivered in great time, and created smiles for my husband. In addition, the flowers have remained beautiful and fresh looking for several days now. Best of all about this company is the customer support. They are very professional and responsive to questions, and will work with you so you can get what you're looking for. Because of this, I was happy customer and will definitely be ordering from them in the future. I order this at 2:30 a.m. for my wife's birthday,paid for delivery before 2pm the same day and they were delivered by 12. I highly recommend this company great service,beautiful product and my wife loved them she was the envy oy the other ladies at the office that day.lol. The flowers were fresh and lasted for over a week. She was quite pleased with the flowers. I would order it again. I was looking for flower delivery last minute (same day delivery), So glad I found them. The flowers are beautiful and they saved my day. I always purchase flowers for my wife every birthday and other special occasions. I have always purchased them the day before and then had them on the table in the morning when she got up. This time I decided to send them to her office and she was really surprised. She thought I forgot and there would be flowers when she got home ( we've been married for 45 years and she has received them every year!). She loved getting them at work and her co-workers enjoyed them as well. I will do this again!! Great Job. Great Product. On time! You did a fantastic job, enough for me to get a phone call back to thank me and tell me how beautiful they were. Wow, these flowers were amazing. My girlfriend of one year told me these flowers made her day. She said they looked beautiful and smelled amazing. Thank you for a great product!!! Product specs were similar to what was presented on the site. Fresh flowers and prompt delivery. The only drawback was the 150 characters limitation on the message it was way too short. I buy flowers a lot for my adopted mother. By far she said these were the best she has received. I have ordered flowers in the past from another on-line service and was greatly disappointed. I was pleasantly surprised that the florist did a great job matching what I ordered and the size was what would be expected for what I paid. My Mom loved the flowers, and I will definitely order again in the future from this website! Thank you! I was very pleased with this order ! It looked similar the picture other than the vase was deep purple but it was Beautiful! You were great! Thanks a lot! My friend on the other end really enjoyed receiving these at her home. The recipient was pleased and loved it. The florist called and advised that they could not driver to the ICU. They promptly delivered it to the alternative address I provided. Great gift for a great price, that can't be beat. Courteous Service & Nice Gift. Didn't see the bouquet, but the recipient said they were pretty. They had address the wrong but called and got directions....Recipient was happy with flower gift. Excellent value, free delivery special, and the flowers were gorgeous. I was worried about getting the dregs with Valentine's Day just two days later but the flowers were perfect. I could not have picked a better arrangement at the florist's shop. I have ordered online flowers before only to have them arrive wilted in a box, but this was not even close to that experience. I am very happy to have found this company. What a great selection and wonderful prices. I look forward to using you in the future. The Flowers Arrangement was nice. My friend was so happy with this flowers. After 1 week they looked fresh and beautiful. I had ordered this bouquet for my mother for her birthday and I wasn't quite sure of what to expect, but from my mother's reaction, it was great. She loved the bouquet the minute she had seen it and she is still enjoying it today. A week later since her birthday, the flowers are still blooming and are as vibrant as the first day of arrival. She also loves the vase. I would recommend this to anyone who has a birthday or any other special occasion coming up. The flowers were delivered as promised and ready the next day when my wife arrived at school. The flowers were beautiful and my wife was happy to show them off. As far as I can tell, this was a big hit with the person I sent it to! The flowers were beautiful. It made a sad day a little less stressful. I sent this as a birthday gift, my friend absolutely loved her flowers. My son and his wife said they were vibrant colors and beautiful. Thank you for the extra fine service. I would definitely recommend this firm to anyone. Delivery was right on time too. order on your web page and the feedback was very good. I will recommend you to my family and friends, thanks so much. My lady loved the arrangement. She was impressed. I did not see the flowers, but my girlfriend liked them. Delivered at very short notice for same day delivery. Delivered article as that displayed on the website! Excellent & well priced service all round. Delivered at very short notice for same day delivery. Excellent & well priced service all round. I was very satisfied with the same day service that was prompt and at a reasonable price. The exact vase and flowers wasn't available so the florist put together an arrangement that was better than the one I chose. I'll be using this service again. Everything was perfect, sent flowers to my girlfriend on holiday. Very good product and excellent service. Brian on live chat , worked out all doubts. Thank you very much. Will recommend! I was late getting started with the order; in fact it was around noon. Somehow they still got the order delivered while my wife was at work. Thanks a bunch! Oh, and the bouquet was beautiful. Nice job. Ordered delivery to my girl's work. Flowers were delivered ahead of schedule (by 2 hours), in a slightly different vase, but other than that everything was perfect. She was really happy and it made her day. This arrangment was much more beautiful visibly, then when I chose them from the site. The delivery time was as prompt as the time provided. I will most certainly be using them again on a regular basis. Beautiful bouquet delivered on time. Easily done on the web from Europe for a USA delivery. I ordered these at 9am and they were delivered by 2 pm. Great service and I highly recommend them. I sent this to my daughter for her birthday, and she was very happy. Ordered this arrangement in minutes and it was delivered in hours. They have the most beautiful and fresh flowers. The delivery is on time.They give you exactly what you ask and you need! I appreciate how expeditious the process was and the efficiency displayed in making a last minute order work to my satisfaction. Thanks! We sent flowers to our daughter and found that this Flower Shop performed above our expectations!! We would highly recommend them to any customers. My wife was completely surprised and loved the flowers. I have ordered flowers from other places on the internet, but these were definitely the most beautiful. I would recommmend to everyone. Flowers were delivered as it should on the same date as specified in the order. A flower delivery company to trust. The flowers looked beautiful and very presentable. I live in the UK and I was very pleased. By the way you were very helpful and very nice to talk to online. The lady I sent them to was overjoyed to receive them on her Birthday. Really nice bouquet! Definitely recommend it! The bouquet got rave reviews from the recipient. I was very pleased to be able to order online and track the order - to a point. I got confirmation on the order and that it was scheduled for delivery. I would not have known if it had been delivered if the recipient hadn't called to thank me. But it was delivered in a timely manner, perfect in fact. I now have your number in my directory and look forward to using your service again. Not only was it a gorgeous arrangement but the quality is great. We still have them on the counter a week later and they still look fresh. My daughter was pleasantly surprised especially with a Sunday delivery. Thank you for the great service, beautiful arrangement, and timely delivery. Recipient was overjoyed! Flowers Great! Service even Better! This bouquet of Flowers was very nice indeed. My loved one that I sent this to, absolutely LOVED it. What I was most impressed about was the service. They called/emailed to tell me that orders were being delayed because of Mothers Day. OK, totally understandable. I simply said, OK deliver it when you can. They delivered it the next day. I also asked for my delivery fee back. They gave it back to me with no hassle. Because of this great experience, I will for sure be using them again and again! First time ordering ... Process was easy and simple, flowers got delivered the same day! I bought the standard flower, which are small. So I recommend to pay more to have more flowers. About the delivery was exactly on the date. Some of the flowers were out of stock but a beautiful arrangement was done anyway and my friend loved it! Thank you very much. I did not see the flowers personally, but they all appreciated the flowers and said they were great. Everything was superb. I only want to say a recommendation: I think it is better if you makes your website bilingual (English-Spanish). Recipient reported flowers were "fresh and beautiful" and they were delivered as requested. This was very good! thanks! delicate!